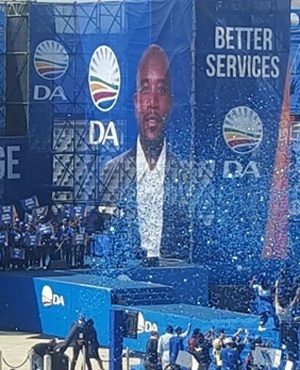 The stage bearing DA leader Mmusi Maimane's face at the party's election manifesto launch in Johannesburg. For the better part of the last decade the City of Cape Town has been the pride and joy of the Democratic Alliance; an example of good governance. In 2008 then mayor Helen Zille was voted the best mayor in the world and early last year Patricia de Lille was awarded a key position in the Global Parliament of Mayors. The party used this model to govern in coalitions in Nelson Mandela Bay, Tshwane and Johannesburg. The DA is in effect controlling the major metropolitan areas of the country. Their mission has always been clear: Where we govern, we govern well, so that the people of South Africa will see the DA is a party that delivers services to everybody. That is until it became clear that their flagship municipality is about to run out of water. It’s difficult to keep track of what’s going on within the DA run City of Cape Town. Mayor Patricia de Lille stands accused of eight charges of "governance failures", for which she will now be investigated by the DA’s Federal Legal Commission. The city manager Achmat Ebrahim suddenly resigned and a transport official, Melissa Whitehead, was suspended after allegedly covering up irregularities in which De Lille is implicated. Last week DA leader Mmusi Maimane propelled himself into the eye of the storm with a highly publicised town hall meeting. On social media some people compared it to a church service, with Maimane as the preacher and the rent-a-crowed (mostly DA supporters) as the congregation hanging on his lips. Finally, we were going to get answers and a practical plan for Day Zero. Instead, citizens got a regurgitation of information that was already in public domain and the event turned into a spectacle culminating in a motivational speech to avoid Day Zero. I get the fact that politicians want us to remain optimistic and avoid Day Zero, but that is not what the people wanted to hear. We wanted a solid plan that does not involve the blame-game; we know national government did not play its part, but that is not helping us right now. This is not the behaviour one would expect from a party who has hammered the ANC countless times about their incompetence. If the tables were turned and the ANC run eThekwini Municipality (Durban) ran out of water, you can be sure the DA would have been all over the situation to cast blame to the ANC. There was also a glaring omission in the line-up of speakers: De Lille. The DA's federal executive has ordered its city caucus to formally hand over leadership of the city's drought response to deputy mayor Ian Neilson and mayco member Xanthea Limberg. Even though the allegations are not linked to the water crisis, the DA still felt the need to strip the mayor of her responsibilities. Days after the event News24 did an interview with Neilson where he couldn’t even answer basic questions about Day Zero. How is this supposed to instill confidence in the DA as a party of good governance. What will this mean for the DA? A day is long in politics, but I doubt that I will eat my words if I predict this debacle will cost them dearly in the 2019 elections. With a weaker ANC headed by Jacob Zuma, they managed to increase their support in the past few elections. "A vote for the ANC is a vote for Jacob Zuma," is the mantra they spread. But the tide has turned. Suddenly there will be no more Zuma to be blamed, their own handling of the water crisis will hover over them and voters will have determined if they made a tangible difference in the metros where they govern. Cyril Ramaphosa might not have a magic wand that will wave away all of the ANC's problems (systemic corruption, state capture, lack of moral leadership), but he has instilled a renewed sense of optimism in the minds of many voters. And this is where the DA is currently failing. Their handing if the water crisis is not reassuring to millions of citizens that they are indeed competent to govern the Mother City (and by extension the Western Cape). Are we not holding the DA to a higher standard, you might wonder? De Lille has after all proven she did not use public funds at her private residence inappropriately and nothing conclusive has come out of any investigations. Compare this to the ANC's track-record and you would be correct to say that a DA run city is not as bad as many ANC run cities. But this doesn’t mean we can’t and shouldn’t criticise the DA. They are in government and they are accountable to the citizens. The moral scales between the DA and the ANC might not be equal, but no party is above scrutiny. It’s time we move away from party loyalty; let’s be loyal to the people, the voters, the citizens. This should be a wake-up call for the DA – get your own house in order before you start pointing out the mistakes of the ANC. If Day Zero comes, it will forever be known that Cape Town became the first international city to run out of water – not whilst the ANC was in government, but under the supervision of the DA. Let that sink in for a moment. - Joshua Carstens is a content producer at Health24 and a Masters students in Political Science at the University of Cape Town.